I hadn’t heard about Co-Op until my friend Inbal suggested it for her birthday dinner. Everyone consults the foodie. Her shock and awe at my lack of knowledge on this Soho-situated establishment matched my shock and awe at the food and how fantastic it was. Despite the ominous and dark decor in the dining area (which is hard to do considering the roof is a giant skylight), the food was positively uplifting. It’s rare that I go to a restaurant and enjoy a meal from start to finish, so bravo, Co-Op – ya did good! We wanted to share everything, and Co-Op is a great place to do that. Perhaps that’s why they call it Co-Op? Because they can make their orders up to account for the number of people in your group. 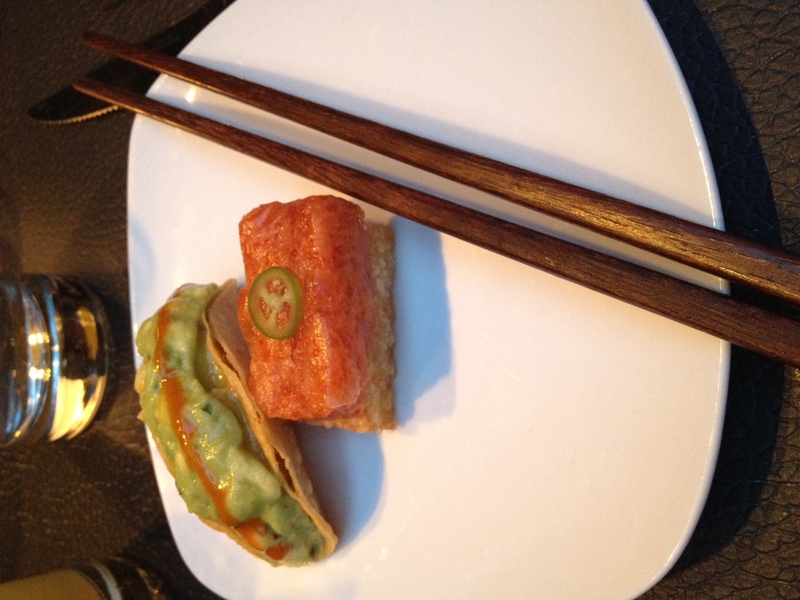 So if you have 4 people, you will get 4 pieces of spicy tuna on crispy rice, or 4 mini ceviche tacos. Isn’t that awesome? I think so. The dishes here are more composed than they sound, but I think that was actually a good thing. 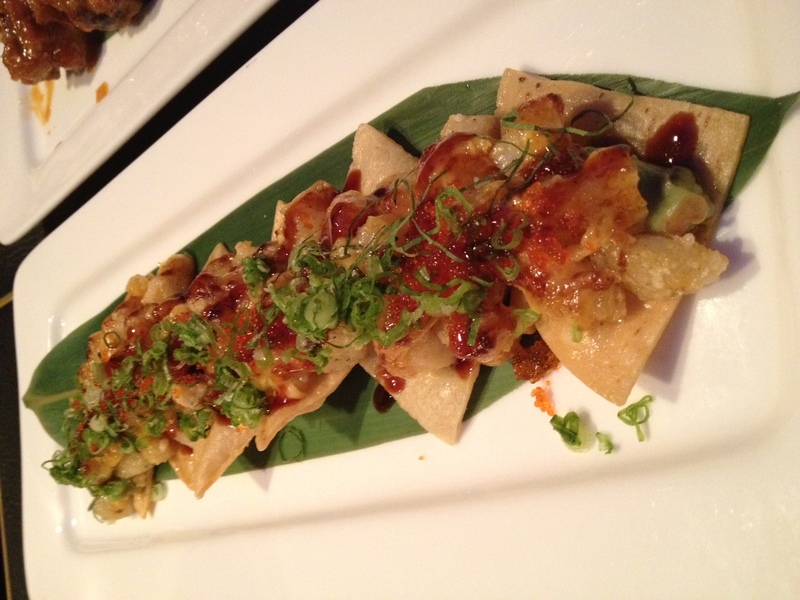 The Spicy Scallop Nachos, for example, were not a big, messy pile of chips and fish (though I wouldn’t hate on that), but rather a perfect line of golden tortilla chips topped with scallops, spicy mayo, sriracha, avocado, and scallions. Perfect for me at this point in my “diet”, because it was easy to just eat the fish right off of the top of the chip. You can call me crazy, I can call me maybe. I think we’ve reached the point in our virtual relationship that I can be up front about my vices. Chicken wings are one of my vices. I guess it could be worse – I could be addicted to crack. Or cilantro. Ew. Cilantro. 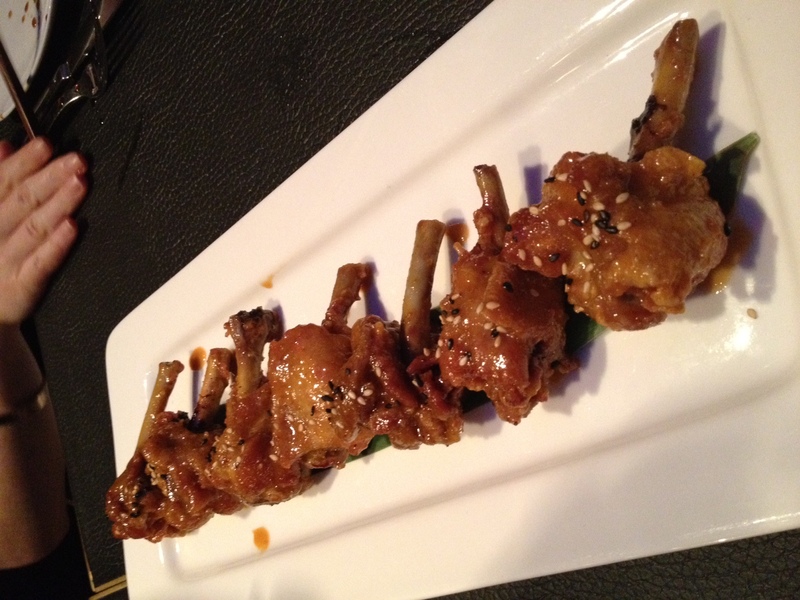 Anyway, the chicken lollipops at Co-Op were not inherently wings, because they were butchered to make them look like a lollipop: cleaned bone, for safe and sanitary handling, and a meaty, fried top covered in sriracha and toasted sesame seeds. The result? Crunchy, sweet, and spicy. Even though I’m not eating rice, I HAD to try a bite or two of the sushi rolls. HAD TO. My friends were literally twisting my arm and telling me that if I didn’t eat the sushi, they would steal my cat. So obviously, I have to protect my poor cat, and I ate the sushi. 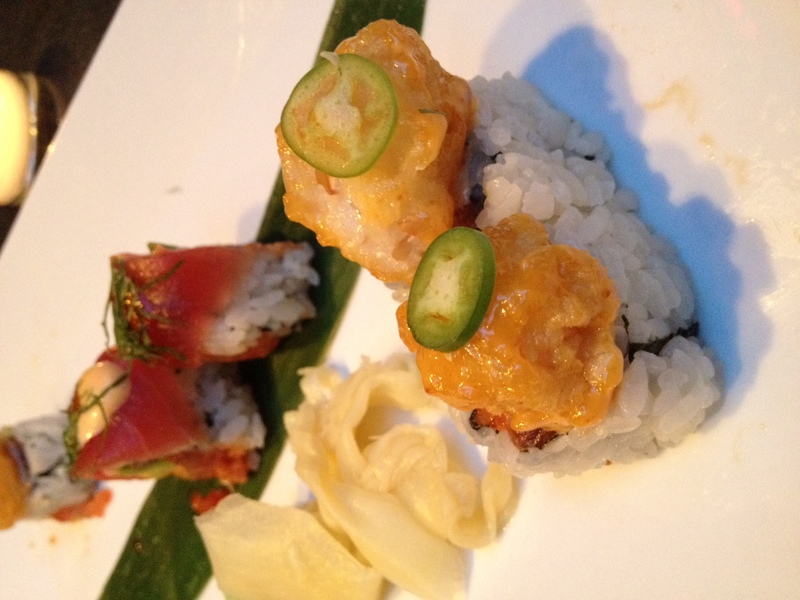 The Co-Op roll was spicy tuna topped with rock shrimp tempura and a thin sliced serrano pepper. Perfect amount of heat if you like spicy food, but I would discard the serrano pepper if you’re sensitive to it. My friend took one bite and said her lips were on fire. Thats…what…she…said. Despite my glowing reviews of the food, I have to say that Co-Op made one major fail: WEAK DRINKS. I’m sorry, but when I’m paying upwards of $10 for a vodka-soda, I expect it to go to my head a little bit. And let’s just say that I had three – yes, three – and felt practically nothing. I think my eyebrow twitched at one point, but that could just mean I’m having a stroke. It was disappointing, annoying, and unnecessary. For the prices they charge, they could afford a heavier pour on those bevs. My lips WERE on fire. That is all.